The trick to making a nice tight roll with a good spiral, is to roll your cake while it is still warm. As soon as it’s finished baking, flip your cake over onto a clean, old kitchen towel that’s been sprinkled with cocoa powder and roll it up tight. Allow the cake to cool completely in the towel. When you unroll the cooled cake and spread on the filling, it will bounce right back into shape. I lightly oiled my rimmed cookie sheet (or jelly roll pan) with coconut oil, lined it with parchment paper, and then oiled the top of the paper as well before spreading the cake batter on top. Transferring the cake from the pan to the towel was effortless this way. 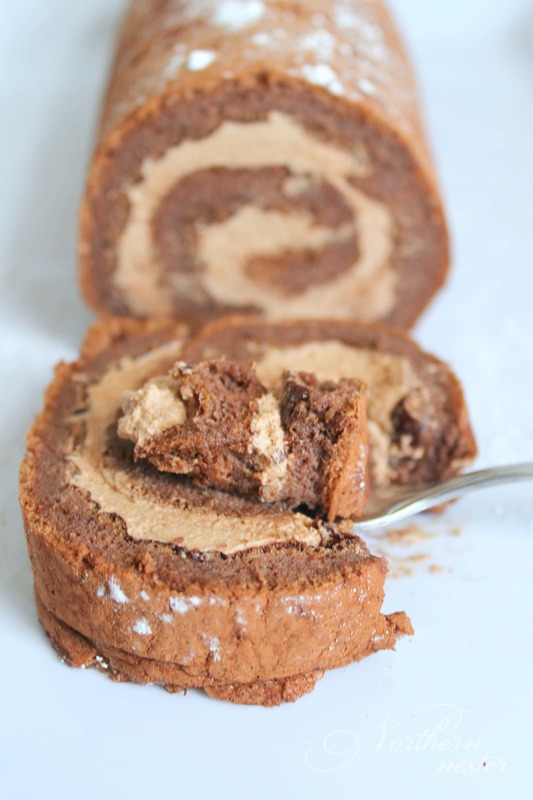 There is no flour at all in this Mocha Roll, making it particularly easy to roll up. It also means that in addition to being low-carb and sugar-free, this dessert is gluten and nut-free! It’s also a great way to use up eggs; there are 8 of them in here! The mocha-flavored, mousse-like filling is made by beating a little cocoa powder, instant espresso powder, and sweetener (I used xylitol, but you can use Gentle Sweet in half the amount, if you prefer) together with whipping cream. The cake is made from eggs, cocoa powder, cold coffee (I used Tim Horton’s brew like a good Canadian), sweetener, vanilla extract, and a little mineral salt. 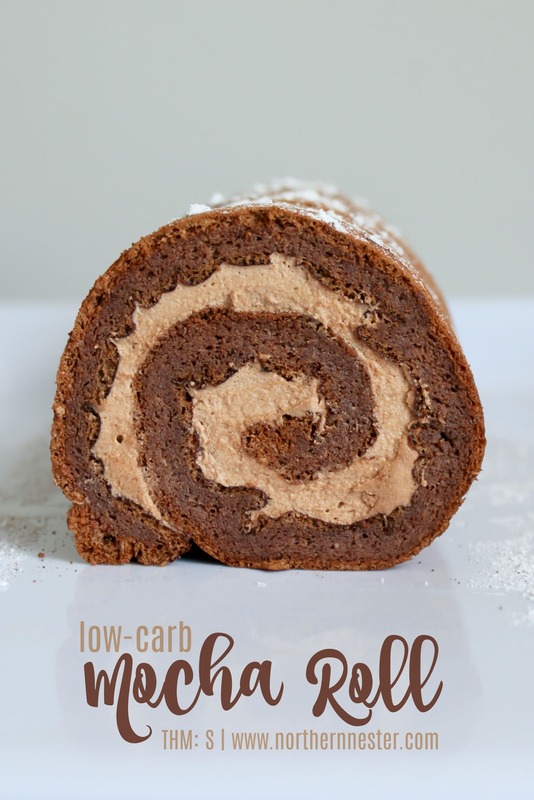 This impressive looking low-carb Mocha Roll is a cinch to make and a very budget-friendly Trim Healthy Mama S dessert. Ideal for a Christmas Yule Log! Preheat oven to 350 F. Lightly grease a rimmed cookie sheet or jelly roll pan. Line with parchment paper, grease the top of the paper, and dust with 1 Tbsp cocoa powder. Set aside. In a large bowl, beat egg yolks, sweetener, 2Tbsp cocoa powder, salt, coffee, and vanilla extract together until mixture is thick and light brown. In a separate bowl with clean beaters, beat egg whites until stiff peaks form. Gently fold egg whites into chocolate mixture, one third of the batch at a time, until smooth. Pour into prepared baking sheet and bake at 350 for 20 minutes. While cake is baking, lay out kitchen towel and sprinkle it with 1/4 cup cocoa powder. After cake is finished baking and has cooled slightly, invert onto cocoa-covered towel and peel off the top piece of parchment paper. Roll up carefully inside towel and let it cool while you make the filling. To make the filling, beat whipping cream, sweetener, cocoa powder, and instant espresso powder together until stiff. Unroll cooled cake from towel, spread on the filling, and roll cake back up. Trim the ends with a serrated knife. Optional: sprinkle powdered sugar substitute (Swerve) on top for "snow." You can cover the mocha roll with a chocolate ganache and use the tines of a fork to create "tree bark," if you want to use this recipe for a Yule Log! Where do you get espresso powder? I have not been able to find it in my area 🙁 is there a substitute? I am definitely going to make this, but may I ask how long ahead it can be made, and if it can be frozen? Hi Kathy! You can make this up to 2-3 days ahead of time, and yes, it can be frozen! Well, this is what I am going to make to take to a family party at the end of the month. Since we have to travel, it will be perfect to assemble before we leave, and will transport well frozen. Thank you! Any chance this could be made non-dairy. I understand the challenge of the whipped heavy cream. Just curious. And hopeful. This looks amazing and I love that it’s budget-friendly and doesn’t use any special ingredients!! I just need to stock up on my sugar substitute again. 🙂 Thanks, Jacinda! Thanks Jaimie! I hope it turns out well for you!! Is 1/3 cup of cocoa powder supposed to all be used for the cake part? I am wondering as well. It says 1/3 c. Cocoa, divided…? Hi Kendra, and Deanna! 1 Tbsp of the cocoa powder is spread onto the parchment paper. 1/4 cup of the cocoa powder is spread on the towel, and 1 Tbsp is used in the filling. You’ll have a tiny bit left over that you sane sprinkle on top of the cake. How much cocoa goes into the cake with the eggs? It’s unclear for that part. 1 Tbsp of the cocoa powder is spread onto the parchment paper. 2 Tbsp go into the cake. 1/4 cup of the cocoa powder is spread on the towel, and 1 Tbsp is used in the filling. You’ll have a tiny bit left over that you sane sprinkle on top of the cake. What is the purpose of greasing the pan & then putting the parchment on top? Parment doesn’t stick to the pan. It just sounds like an uneccessary. Am I missing something? Hi, Is there any way to make it a chocolate roll without the coffee? My question too. In fact, I plan to leave out all coffee (just not fond of the flavor) and thought I’d sub cocoa powder for the esspresso powder & another liquid (maybe flavored tea) for the liquid coffee…? Can I freeze or make ahead? Made today, Saturday, bu5 wondering if I should wait to fill it. Is this recipe missing flour in the cake recipe? Nope! There’s no flour in here. This was absolutely divine!! I love finding gluten/nut/sugar free recipes that really do taste great and do not need online shopping! Just a quick question… I rolled it lengthwise which gave a lot of pieces (great for church function), but is it supposed to be rolled from the short edge? Keep up the awesome job!